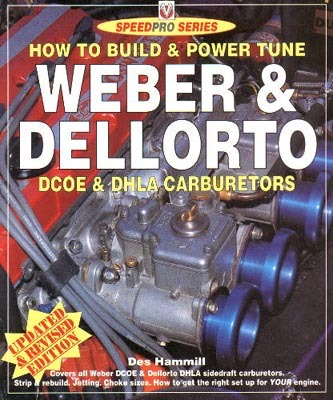 How To Build & Power Tune Weber & Dellorto DCOE & DHLA Carburetors by Des Hamill, is part of the SpeedPro Series, published by Veloce Publishing PLC Dorchester, England, in 1996, ISBN 1-901295-64-8. This large soft-cover 112 page manual contains many photographs and step-by-step instructions for dismantling and assembling Webers and Dellortos, with no bias for one brand over the other. Clear and descriptive writing (along with the accompanying photographs) will probably help the novice tackle a rebuild. It also contains a nice chapter on jet suggestions and settings, but I don't think it has much for "Power Tuning" suggestions as claimed in the title... Did I miss something? It is available new through many bookstores (March 2001).